We are all about themed weeks and this week the focus is pirates! I wanted to find some good Pirate Picture Books that were not too violent or scary. We headed to the library to grab a huge stack of books. 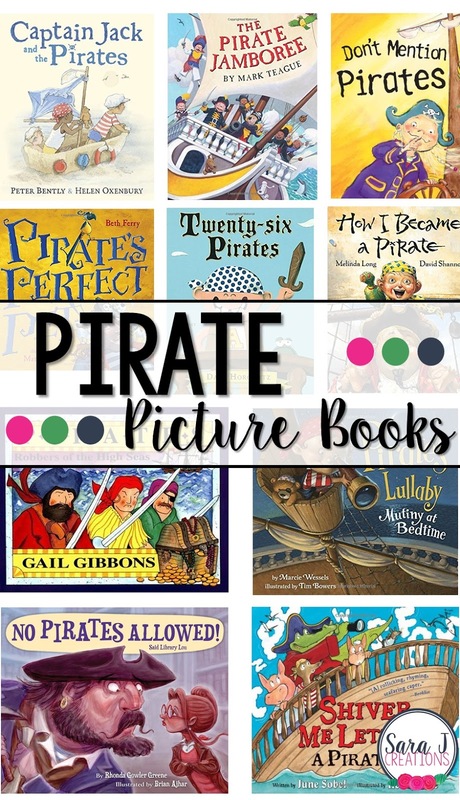 Here are 10 of our favorite pirate picture books. Do you have a favorite to add to the list? In this story, the grandma, Long Joan Silver, was a famous pirate who was eaten by a giant shrimp and the rule from that day on was don't mention pirates in the house. All that changes when they think they've found gold outside of their house (which is a pirate ship) and they start digging and digging until pretty soon their house is on water and they have to become pirates. In this rhyming book, three friends Jack, Zack and Caspar make-believe that they are pirates during a day spent at the beach. This book would be good for vocabulary as it uses lots of "pirate" and boating terminology. It appears that pirate parents fight the same battles that we fight at bedtime - kids who need to tell us one more thing, kids who need a drink of water, kids who need another book and exhausted parents who fall asleep before their kids do. Captain Crave is in search of the perfect pet to make him a true pirate. He searches the sea and the beach, a farm and then a zoo and finally finds the perfect pet for him at the pet store. Can you guess what he picks? A loud, rough, gruff and dirty pirate comes to the library in search of a treasure. A strong-willed librarian has a plan and tricks him into coming back each day in search of the treasure. Each day she teaches him letters and sounds until he learns to read on his own and discovers that the real treasure is books. A young boy learns first hand about life as a pirate as he is taken aboard a ship and learns how to talk and act like a pirate. But he also learns that he misses being read to and tucked in at night like he had back at home. Maybe being a pirate isn't everything he thought it would be. This is a silly alphabet story and each letter names a different pirate and something about him that rhymes. At the end you have a pirate ship filled with these silly 26 characters. Gail Gibbons always writes great non fiction text for young readers. This book gives lots of facts about pirates, lists famous pirates and gives a bit of the history of pirates in a kid friendly way. The meanest pirates around are gathering for a jamboree. They party hard and then suddenly scatter as they see the SS Clean Your Room coming their way and they know their fun is over for the day. This would be another book that would be good for inferring meaning of vocabulary words. Another fun ABC book where the pirate crew has been ordered to capture all the letters of the alphabet. They can't miss a letter or they will be forced to walk the plank.